Georgian building 1788 with period features. Large spacious rooms with views. 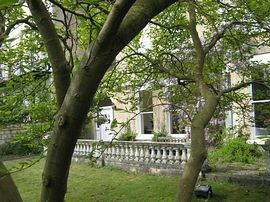 Grove Lodge is a fine, Grade 11 listed Georgian villa built in 1788 in a green landscaped setting. 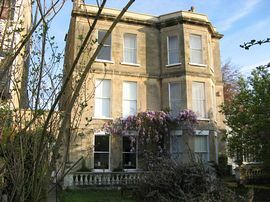 The rooms are all large with high ceilings, period features, Georgian marble fireplaces, with large windows over looking the garden, some with far reaching views. The en suite bathrooms are large, some with Georgian fireplaces and double showers. 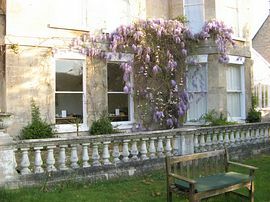 Breakfast is served in the sunny dining room overlooking the garden, which is home to a resident squirrel. Our menu offers a wide choice including fresh fruit, yoghurt, cereals, continental or English breakfast. Free range eggs and local organic produce is used when ever possible. Gluten free and vegetarian diets are catered for with prior notice. Convenient free on street parking, also on a bus route. Single occupancy: £50.00 - £60.00. Standard twin: £69.00 - £72.00. Superior double en suite rooms: £75.00 - £84.00. Check in from 2.00pm. Closed for Christmas and New Year. Two night minimum booking at the weekneds. Special Diets Provision: Special diets are catered for. vegitarian and gluten diets catered for with prior notice. 400 metres west from the A46 / A4 junction , on the north , east side of the city.